This Hungarian mushroom soup recipe is rich, flavorful, and easy to make. With plenty of spices and meaty mushrooms, it's the perfect comfort food, This robust and creamy Hungarian Mushroom Soup recipe will be one that you'll earmark to come back to again and again. 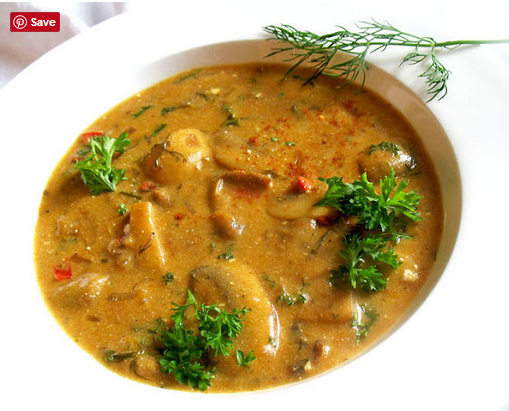 A fragrant, creamy and beautifully flavored Hungarian mushroom soup seasoned with fresh dill and paprika. I love mushrooms. I could quite literally eat them every single day without tiring of them. And I do love soups. Until I tried this recipe for Hungarian soup, I thought I had a a favorite mushroom soup recipe, but now I'm not so sure. I've had this recipe up for one my all-time favorite mushroom soups for over seven years, but I've never forgotten about it all this time and felt that it is just that good that I should share it again for all those readers who have come along since that time, complete with updated photos. Creamy, fragrant and just perfectly seasoned with paprika, lemon and dill, I am confident that this Hungarian soup will also become a favorite for anyone who missed it the first time. In a large saucepan, melt the butter over medium heat. When hot, add the onions and sauté for 5 to 7 minutes or until softened and translucent. Raise the heat slightly, add the mushrooms. and sauté for another 5 minutes or until the mushrooms are cooked and just begin to release their juices. Add the dill, paprika, chili, tamari and vegetable stock or water. Simmer on low heat, uncovered, for 12 to 15 minutes. In a medium bowl, whisk together the yogurt, buttermilk, and flour. Stir the yogurt mixture into the pot. Cover and cook gently for another 12 to 15 minutes. Add the lemon juice, and season with salt and pepper to taste. Remove from the heat and stir in the sour cream and parsley. Serve hot or warm, garnished with chopped dill, parsley or a sprinkle of paprika. 0 Response to "Hungarian Mushroom Soup Recipe"